Over 225 pages, 275 color images, and 36 case studies of exemplary healthcare arts projects and programs addressing hospitalized patients, children, seniors, cancer patients, adolescents, public education, and healing from tragedy. 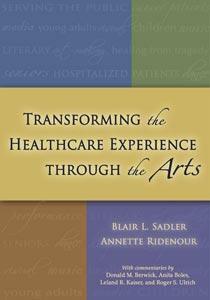 Discusses the role of the arts in healthcare, a CEO’s perspective on arts programming, a practical guide for arts program implementation, and more. Includes research on how the arts decrease pain, reduce stress, and improve mood, as well as contact information for artists, healthcare organizations, and arts-in-healthcare organizations.